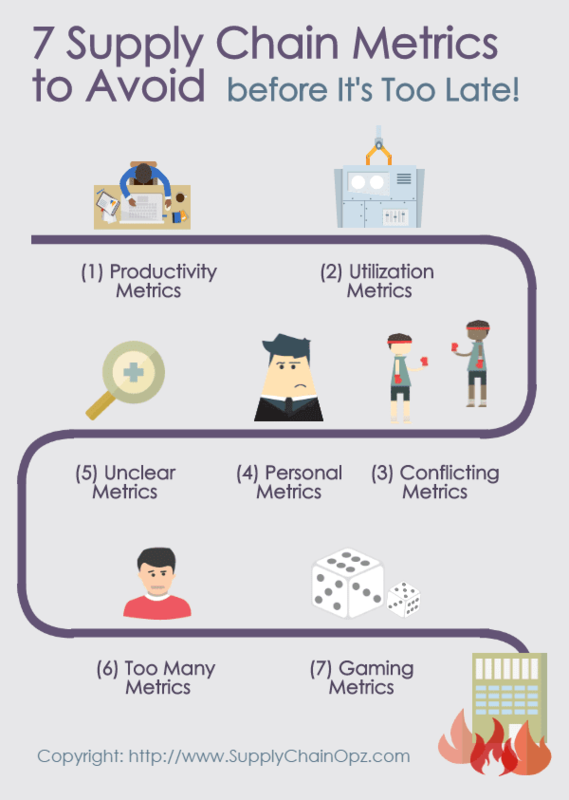 7 Supply Chain Metrics To Avoid Before It's Too Late! Supply Chain Opz: 7 Supply Chain Metrics To Avoid Before It's Too Late! 7 Supply Chain Metrics To Avoid Before It's Too Late! Supply chain metrics are necessary to supply chain operations, but they may not be used properly. Now we will explain what kind of metrics you should avoid. The easiest way to communicate and show the value of a supply chain operations improvement initiative is to link productivity to cost savings. For example, when warehouse staffs pick the orders faster, cost per order can be reduced. However, this situation holds true only if you are talking about the hourly employee. Suppose purchasing department can issue the orders much faster (say from 100 orders a day to 1,000 orders a day), can you really reduce costs? The answer is NO because the purchase order is usually handled by the salaried employee who is paid a fixed amount every month. The fixed cost that you have to pay no matter what is called "Sunk Cost" which should not be included in decision making. In short, higher productivity doesn't always mean lower cost. So you try to keep machine time as high as possible by building stocks when there is no much demand to fill or try not to change jobs at all to reduce setup time. The consequence of this is that you end up with stocks you can't really sell and the loss of flexibility. Sticking too much to machine utilization is the sure way to hurt the overall performance. Conflicting metrics can cause a big argument between supplier/customer if they are not identified and agreed upon in advance. Can an inventory controller single-handedly reduce the inventory level? If the answer is NO, then, why the inventory turn is always assigned to one person? "VaR = Probability of Occurrence x Monetary Impact"
As you can see, the definition of this metric is clear as mud, especially how to quantify the "monetary impact" part. If you can implement a supply chain risk program, should you use more appropriate KPIs? The conventional wisdom is to "keep an eye on the ball". Then, traditional management always uses a lot of KPIs to monitor the performance because they believe this is the right thing to do. Anyway, they don't realize that using too many metrics is the way to complicate the lives of your staffs and a significant amount of time will be used for data collection and report instead of doing something more productive. This is the result of applying too many metrics. Your staffs will try to game the system by finding the loophole to make the KPIs look better. For example, excluding any late delivery from the calculation of delivery performance. What are some metrics to avoid at all cost? The answer is the metrics that you really don't know how to apply properly. Performance management is the journey, not the destination. So you should use metrics to create team synergy that drives action plans and supply chain metrics are the way to tell you where you are and how far can go. - Hope, J., & Player, S. (2012). Beyond performance management: Why, when, and how to use 40 tools and best practices for superior business performance. Harvard Business Press. - Frazelle, E. (2002). Supply chain strategy: the logistics of supply chain management. McGraw Hill.